Established in 1987, EARLEX specializes in providing wallpaper strippers, heat guns, steam cleaning and painting equipment for both domestic and professional use. 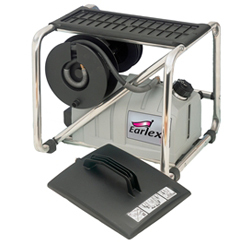 The world's first electric steam wallpaper stripper was launched by Earlex and over eight million of them have been sold to date, making Earlex the UK's market leader. The company continues to be a consumer favourite due to its ethos of providing innovative and affordable power decorating tools. Our customers have rated these products with 5 stars and we offer them at very competitive prices. The market leading Earlex tools include the SprayStation range of products, which have won numerous awards in the industry. Two million of the HVLP (high volume low pressure) paint sprayers have been sold worldwide. Earlex became a member of WAGNER – a world-leading manufacturer of surface finishing systems – in 2013. The Earlex tools range for household use allows consumers to handle a variety of DIY jobs with ease. The equipment includes paint sprayers for a perfect finish, time-saving wallpaper strippers, deep-cleaning steam cleaners and versatile heat guns. For professional use by decorators and painters, the professionally-rated product range includes heat guns, wallpaper strippers and paint sprayers. These tools are durable and hardwearing, being able to withstand continuous use.